Ideas for iPhone helps spark new ideas by visually presenting a personalized idea map, a bird's-eye view of a person's ideas. The idea map becomes more accurate with each new idea. 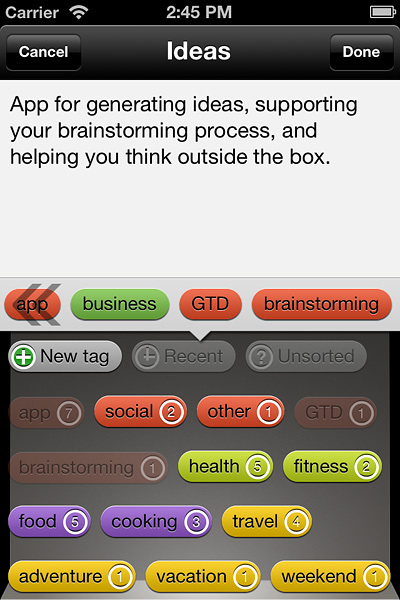 To make idea entry effortless, the app automatically organizes ideas based on keywords it detects in their content. Ideas - Idea generation assistant for iPhone helps anyone think of new ideas by automatically building a personalized idea map, allowing them to see how their ideas relate to each other. The idea map is a visual thinking aid, useful for finding unexplored angles and stimulating new ideas. Since ideas are fleeting, the app makes idea input effortless for the user, while it processes content in the background and keeps ideas organized - automatically. The building blocks of the idea map are automatically managed tags, which describe the user's ideas and give them context. Through clever use of color and on-screen position the idea map suggests both hierarchy and relationships between tags. In addition to being a thinking aid, the idea map provides an intuitive way of navigating ideas. A major focus of the app is convenient idea entry. While the user types or speaks the content of his idea, the app processes each word and attempts to automatically tag the idea, while providing visual clues for the user. Upon completion it updates the idea map, making it more accurate with each new idea. The app supports seamless syncing of ideas across iCloud enabled devices. Additionally, the app makes it possible to export ideas ripe for realization to popular iPhone task management apps, with a single tap. Ideas - Idea generation assistant is available for $1.99 on the App Store. Bluepeak is a mobile software startup based in Ljubljana, Slovenia. It was founded in 2011 by Uros Katic and specializes in apps for the iOS platform, with a focus on productivity apps. Bluepeak is a pioneer in smart mobile apps, which augment the user by learning from him, thus minimizing required input.